DPM Adapter with diffused illumination is the most effective when used with Xenon 1900/1902 scanner, HD version though it will perform well for SR/ER versions as well. 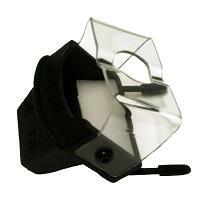 Unlike for the Adapter with magnifying lens, “contact reading” is not so strong requirement. More than that, we would recommend to detach “clear plastic guide” from Adapter (two screws on the sides) if the operator has enough experience in working with Xenon scanner. DPM reading requires 2DTG's DPM Decoder/Plugin for most of the DPM (particularly Dot Peen) marks that can be purchased as an optional product from this page (recommended). Xenon 1900/1902 scanners can be purchased from here.